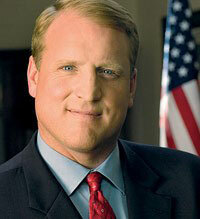 Former Iowa Governor Chet Culver will become an executive for the YMCA in central Iowa. Culver, a Democrat, served four years as Iowa’s governor, from January of 2007 through January of 2011. Since then he’s been working as a consultant in the energy industry and for a group lobbying to get rid of the Electoral College. In July, Culver will become president of the Greater Des Moines YMCA. Culver’s primary job: fundraising. Culver, who is 50 years old, is currently a member of the Walnut Creek YMCA in Windsor Heights. He described himself as a “life-long” Y member. Culver’s being hired after previous directors were unable to complete the new downtown Des Moines YMCA facility. That Y moved from a previous location on the west bank of the Des Moines River to a building a few blocks away that used to be a convention center. The facility has opened, but the expensive swimming pool and aquatic center planned at the site haven’t been built. The former leader of the Greater Des Moines YMCA resigned recently after failing to secure money for the project. Culver said that pool is “obviously” a top priority, but all the facilities and YMCA programs in central Iowa will get his attention. “I look forward to putting together a strategic plan with the leadership team at the Y and coming up with a short-term and a long-term plan to address the needs,” Culver said. Culver also will focus on policy, as the central Iowa YMCAs have programs which promote literacy as well as physical fitness for kids. Another man was hired last month to serve as CEO of the Greater Des Moines YMCA. Culver’s 78-year-old mother still teaches water aerobics at several YMCA locations in the Austin, Texas area.